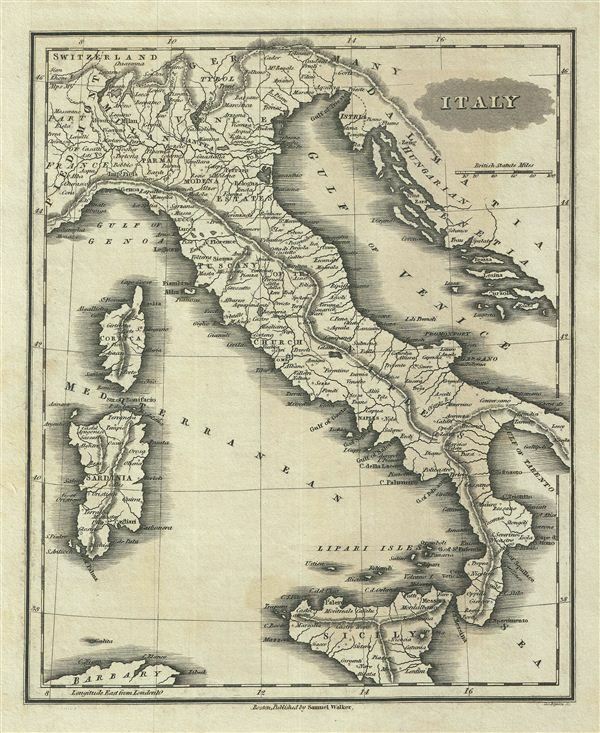 This is an attractive example of the 1828 Malte-Brun map of Italy. It covers the entire Italian peninsula from Switzerland to Sicily. The islands of Corsica and Sardinia are also included. This map predates the Italian solidarity movement and consequently, the peninsula is divided into an assortment of kingdoms, duchies, republics and states. Various, important rivers, islands, cities and other topographical details are noted. This map was published by Samuel Walker in 1828 as part of the American edition of Conrad Malte-Brun's System of Geography, Vol. I.